312 Dartmouth is located on the west side of Dartmouth, between Marlborough and Commonwealth, with 314 Dartmouth to the north and 306 Dartmouth to the south, across Alley 425. 312 Dartmouth was built in 1871 by building contractor George Wheatland, Jr. one of two contiguous houses (312-314 Dartmouth). 312-314 Dartmouth were built on part of a larger parcel of land that George Wheatland, Jr., acquired from the Commonwealth of Massachusetts, and that also included the land where 164 Marlborough would be built. He originally contracted to purchase the land on April 10, 1869, and then entered into agreements with Katharine Crowninshield on August 23, 1869, and January 29, 1870, under which he agreed to sell her the lot for 164 Marlborough once she had completed building her house there. 164 Marlborough was completed in late 1870, the Commonwealth conveyed the land to George Wheatland, Jr., on November 15, 1870, and he conveyed the lot for 164 Marlborough to Katharine Crowninshield on December 15. 1870. He retained the land for 312-314 Dartmouth and began construction soon thereafter. The original lot acquired from the Commonwealth by George Wheatland, Jr., was 80 feet wide (east-west). 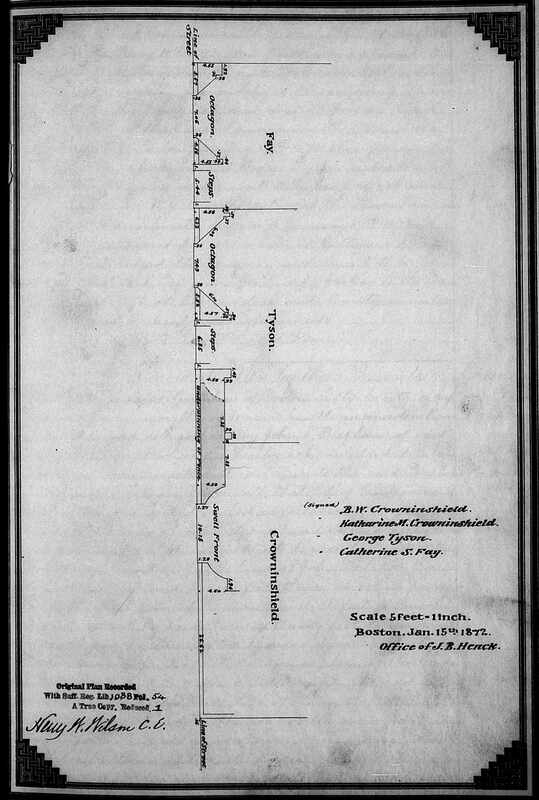 On December 9, 1870, Eben D. Jordan purchased the 25 foot wide lot immediately to the west, and on December 15, 1870, he sold a 7 foot wide strip to George Wheatland, Jr. That same day, George Wheatland, Jr., sold the 7 foot strip at the west of 164 Marlborough to Katharine Crowninshield, increasing the frontage of her lot to 87 feet on Marlborough. He retained the strip behind 312-314 Dartmouth. On April 30, 1874, Eben Jordan sold the remainder of his lot, with a 17 foot width, to George Tyson, by then the owner of 314 Dartmouth, and on July 7, 1874, George Tyson sold the portion behind 164 Marlborough to Katharine Crowninshield, and the portion behind 312 Dartmouth to Catherine Fay, owner of 312 Dartmouth, increasing the east-west depth of each lot to 105 feet. In the December 15, 1870, deed transferring the land to Katharine Crowninshield, George Wheatland, Jr., had agreed to restrictions on the dimensions of the houses he would build at 312-314 Dartmouth so that they would conform with the house already constructed at 164 Marlborough. That agreement also specified that nothing would be built on a small strip of land on Dartmouth Street, about 4.5 feet deep and extending about 7.3 feet at the face of the buildings on either side of the property line between 164 Marlborough and 314 Dartmouth. On January 12, 1872, after 312-314 Dartmouth were completed, their new owners and Katharine Crowninshield of 164 Marlborough entered into an agreement confirming that the dimensional requirements in the earlier deeds had been met and extending in perpetuity the prohibition on building on the small strip between 164 Marlborough and 314 Dartmouth. 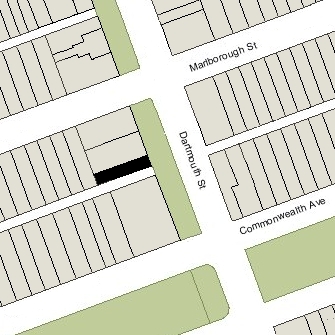 The various deeds and agreements also specified a five foot (later four foot) wide easement at the western edge of 312-314 Dartmouth providing access and drainage from all three properties to the alley. Click here for an index to the deeds for 312 Dartmouth. On July 3, 1871, 312 Dartmouth was purchased from George Wheatland, Jr., by Mrs. Catherine Sanders (Pickman) Fay, the widow of merchant Richard Sullivan Fay. She also maintained a home in Lynn. By 1880, she had been joined by her daughter-in-law, Sarah (Abbott) Fay, the widow of William Pickman Fay, who had died in March of 1879. Sarah Fay continued to live at 312 Dartmouth until the mid-1880s. 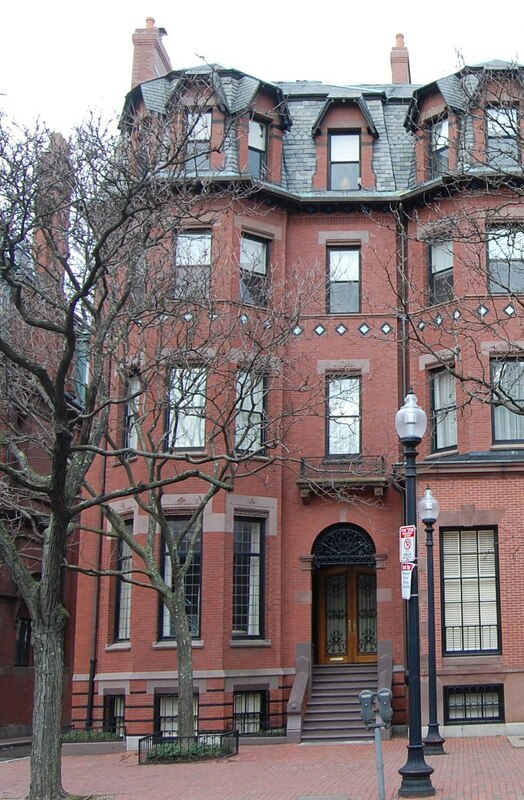 Catherine Fay continued to live at 312 Dartmouth until her death in November of 1901. On April 16, 1902, 312 Dartmouth was purchased from the estate of Catherine Fay by Elizabeth Bowditch (Frothingham) Brown Parker, the wife of William Lincoln Parker. They previously had lived at 339 Marlborough. They also maintained a home in Cohasset. William Parker was a shipping merchant in the South American trade with the firm of Hemenway & Browne. William Parker died in June of 1915. 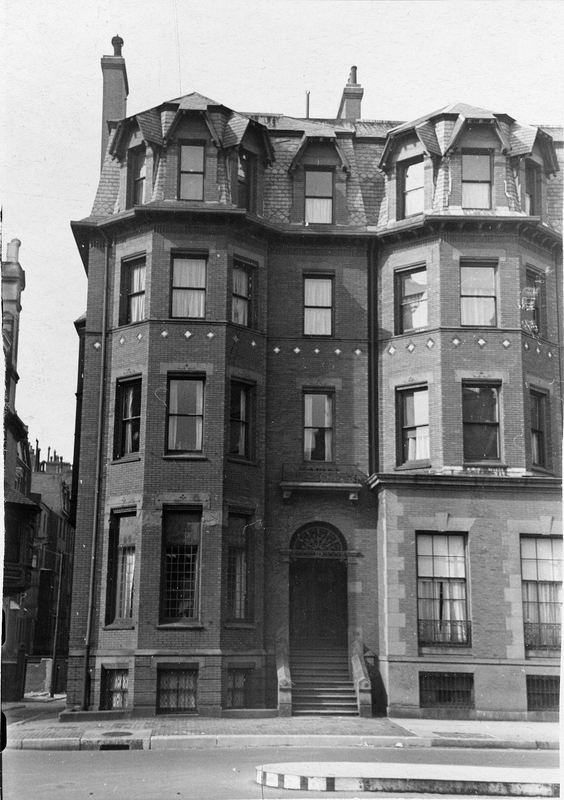 Elizabeth Parker continued to live at 312 Dartmouth until about 1918. She spent the 1918-1919 winter season in Augusta, Georgia, after which she moved to Brookline. By the 1919-1920 winter season, 312 Dartmouth was the home of Carl Dreyfus and his wife, Sylvia (Goulston) Dreyfus. They previously had lived at 120 Bay State Road. They also maintained a home, Thorn Hedge, at Devereux Beach in Marblehead. On September 14, 1920, Sylvia Dreyfus purchased 312 Dartmouth from Elizabeth Parker. Carl Dreyfus was a shirt manufacturer and real estate investor, and from 1931 to 1937, also was publisher of the Boston Record-American newspaper. Sylvia Dreyfus was an artist and served as president of the Hecht Neighborhood house (a community outreach center). Sylvia Dreyfus died in September of 1942. Carl Dreyfus continued to live at 312 Dartmouth, remarrying in September of 1943 to Mrs. Edna A. (Wetzler) Stern, the former wife of New York attorney Walter T. Stern. Carl and Edna Dreyfus continued to live at 312 Dartmouth in 1948, but moved thereafter to the Copley Plaza Hotel, where he died in March of 1951. On November 23, 1948, 312 Dartmouth was acquired by Louis Heller and his wife, Elizabeth (Kayhart) Dare Pendleton Heller. Elizabeth Heller’s mother, Mary Ellen (Smith) Kayhart, the widow of Charles E. Kayhart, lived with them. They previously had lived in Brookline. Louis Heller was a real estate dealer; Elizabeth Heller was a former actress. The Hellers and Mrs. Kayhart continued to live at 312 Dartmouth in 1950, when they moved to 33 Marlborough. On June 30, 1950, 312 Dartmouth was purchased from the Hellers by the Roman Catholic Diocese, and on September 26,1950, the Diocese transferred the property to St. Dominic’s Institute. On June 16, 1961, St. Dominic’s Institute transferred 312 Dartmouth back to the Roman Catholic Diocese, and by 1963 it had become a dormitory for the Teresian Institute. On February 10, 1967, the Diocese transferred the property to the Teresian Institute. On June 25, 1972, the Society of Jesus of New England acquired 312 Dartmouth from the Teresian Institute and used the building for a rectory with an accessory chapel. They had acquired 314 Dartmouth in 1970 and maintained a chapel and offices there. In January of 1983, they filed for (and subsequently received) permission to combine 312 and 314 Dartmouth into one building to be used as a chapel and offices. At the same time, they requested that the legal use of 312 Dartmouth be clarified as offices, which they alleged had been the use for a number of years. That use was approved by the Inspectional Services Department. On March 21, 1983, the Society of Jesus sold 312-314 Dartmouth to Swiss Properties, Inc. It appears they intended to lease the space for commercial offices. The owners filed suit to appeal the Board of Appeal decision, and the case was in litigation until about June of 1987, at which time a settlement was reached. 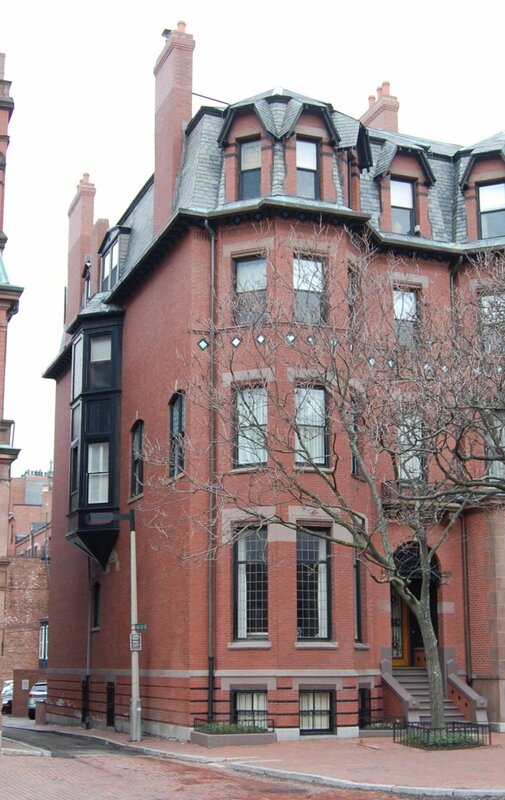 On December 9, 1987, Swiss Properties sold 312-314 Dartmouth to Edgard Puente and David Boersner, trustees of the Boston Dartmouth Realty Trust. On the same day, they converted the property into three commercial condominium units and six residential condominium units, the 312-314 Dartmouth Street Condominium. Over the next five years, the configuration of the condominiums was modified and, by 1992, the building consisted of one condominium that could be either residential or commercial, and four residential condominiums.